…planning to see if I could use it for a class. And when it came, I realized it was a bit larger than I expected, even with the description. Also, the mold removal didn’t seem to go very well for the sender, so I wasn’t as happy with it as I might have been. However, I got to thinking I could use it for a WIP at least, and that that might be more helpful to start with anyway. I still might do a class, but the bust called to me and I had an idea and it ate away at my resolve… so here it is. The plan is to make her into Mother Nature. Originally I’d planned to do a bunch of the sculpting first, but I felt like painting. I’ll get the face mostly done, then do the sculpting and finish painting. 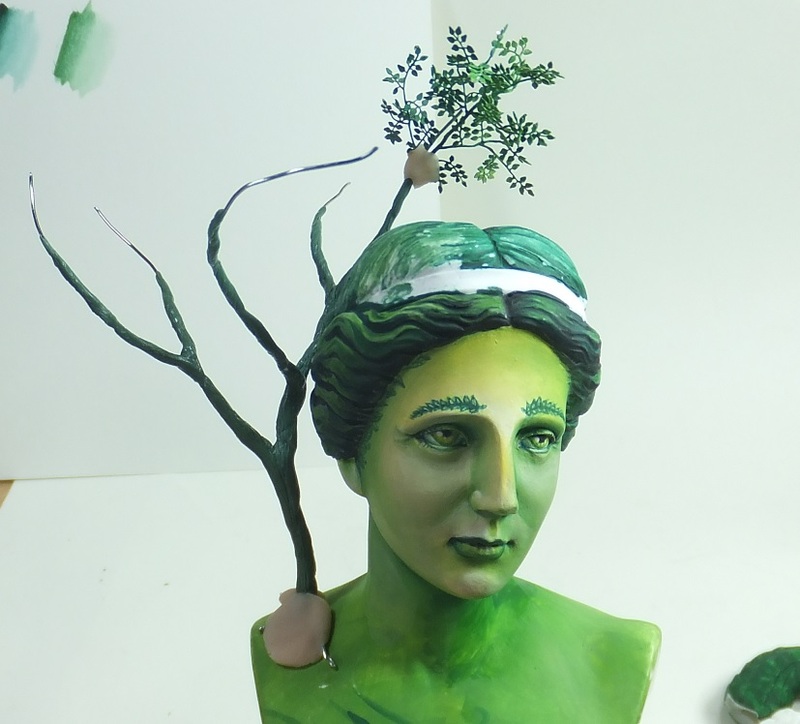 She’ll have a tree growing out of her shoulder, a bunch of leaves and flowers in her hair and probably some other natural and unnatural things to make the whole a more interesting story. I may attach a few animal companions as well. Right. When I decided on the theme, I knew I’d need green skin. One important thing to think about when it comes to skin is that our brains are hardwired to recognize varying shades of tan, ocher, rust, etc as skinlike. The more saturated and intense the color, the less we believe its skin. So no matter what color I want the skin to look like, I need to chose a softer more desaturated color. Green yes, but it has to be a nice quiet and pleasant green. I added the fair skin mainly because it adds more warmth to the whole. Alone, the green will end up looking too weird, but adding a touch of flesh makes a difference- I'll explain with pics in a bit. The peacock green is still fairly cool. I couldn't find a really warm dark green. 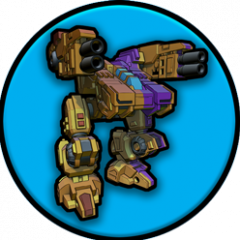 But I can glaze the viper over it in places to warm it up. 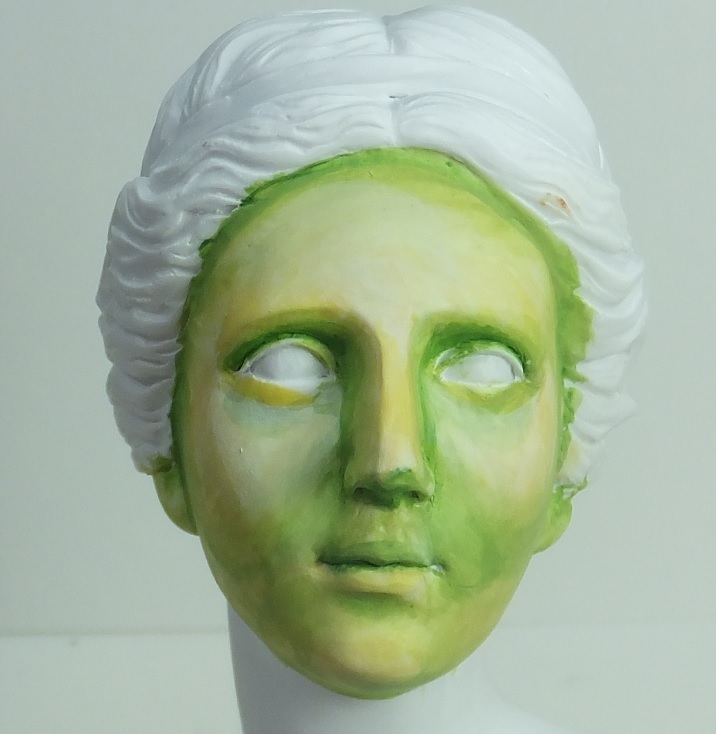 Next, I slathered some paint on the bust to get a sense of how the colors look. Two things. I must decide early on where my light source will be. For a bust, this is probably even more important than a smaller mini, because there’s so much surface area to work with. I have to add enough interest to keep my viewer’s eye moving. 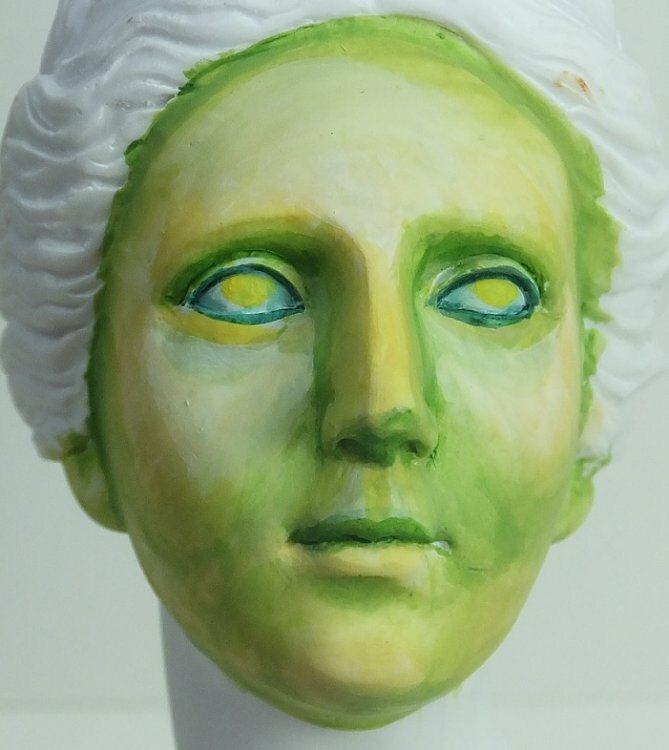 Since the bust is looking down and to the viewer’s right, I’ll make the light source come from the top left. Second thing, I need a model to help me place all of my highlights and shadows appropriately on the face. You know how the phone/digital camera has that cool “face recognition” thing these days? (…showing my age…) We people have the same thing. When we look at a face we expect to see certain familiar features. At 28 mm scale, there’s not much space to work in, but at the bust scale, if I don’t paint the highlights and shadows in a familiar fashion, it’ll look weird. What's with the Picasso? Ah hah! The face is made up of a bunch of planes and mounds and shapes that flow in to each other. When we’re babies, the division between the shapes is less defined. Our baby fat fills in all the gaps. As we age, we can start to see the skeleton behind the flesh. 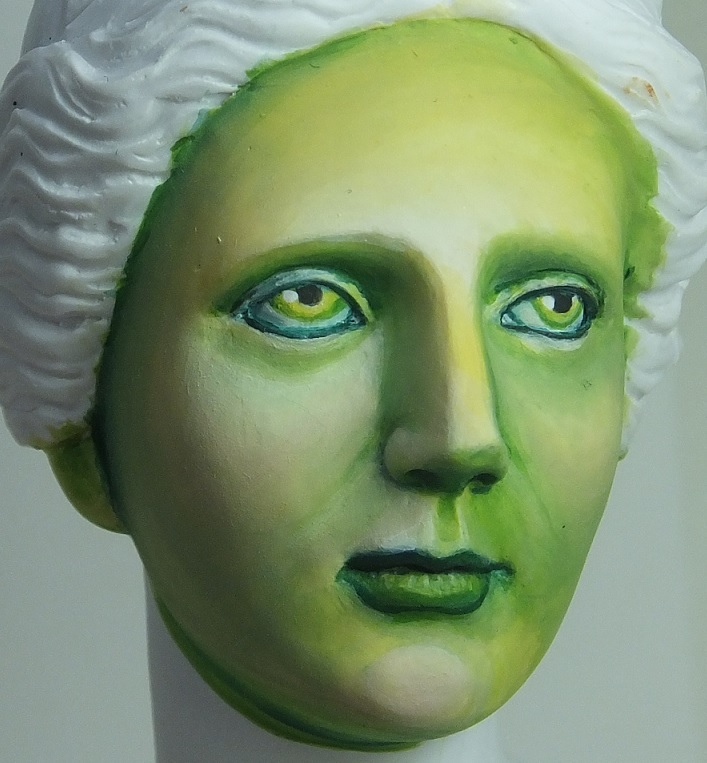 When painting a bust, I make a choice (often based on the sculpture itself) about how old or young I want the figure to be. In this case, I’d like mother nature to have fairly smooth features, but maybe a few lines to make her matronly. I’ll get to that. 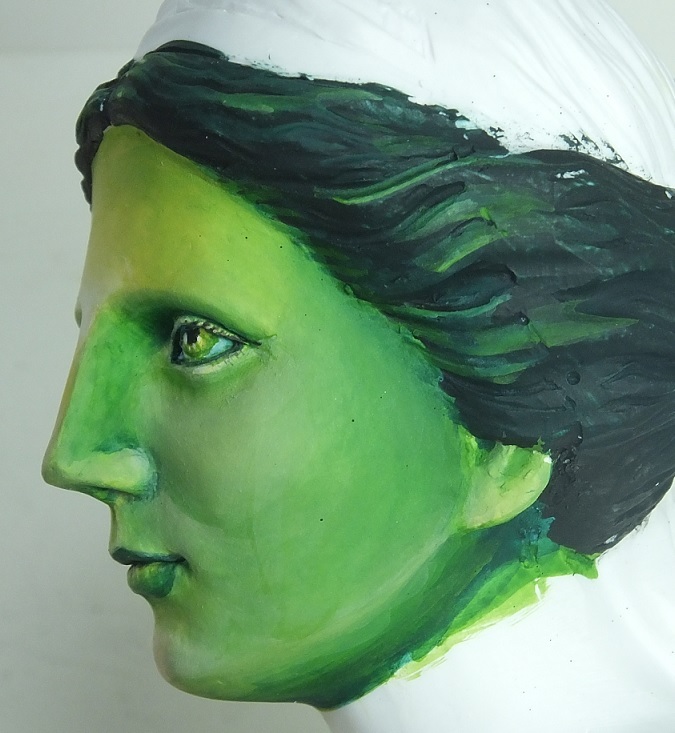 But whenever you choose to paint a bust, think about things like that ahead of time and it will make the process smoother. 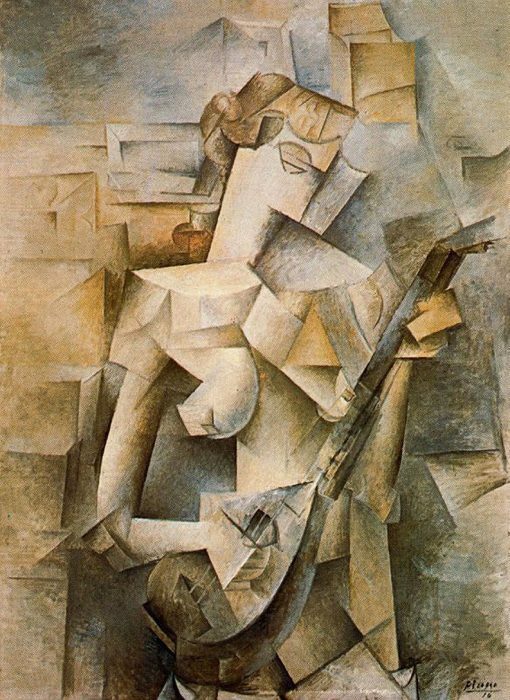 Cubism among many other things breaks down the human into basic geometric shapes. Learning what those shapes are will help you build up a basic volume in each area. Once you have an idea where each of the highlights go in each basic shape, the rest is all blending. But if the bulges don't match the anatomy, it will seem off. If that makes sense. This was a hard concept for me to pick up at first. 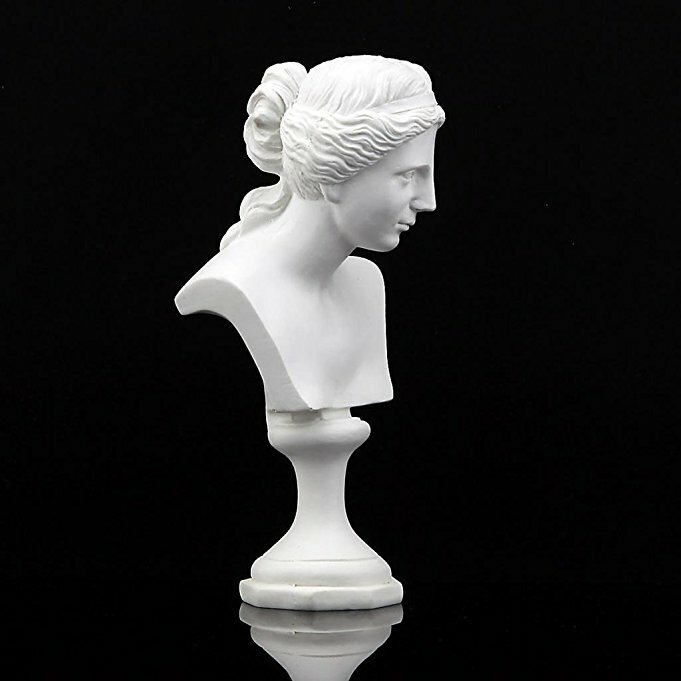 Ok, I generally choose a model for my bust. In this case, I chose Scarlett Johansson. She has lovely clear skin. Now, using her, I can see in great detail with a larger blown-up pic where highlights tend to live and where shadows tend to fall. See how her cheek are sort of square or maybe triangular? The forehead and chin are circles? I grab a variety of pics from hollywood, because I can zoom in and see where all the little fiddly bits go around the eye and whatnot. Having a high resolution photo is helpful as a map to follow. here's me debating gaze direction. and playing with the eye. I've sketched in the basic parts. I did some blending and smoothing. 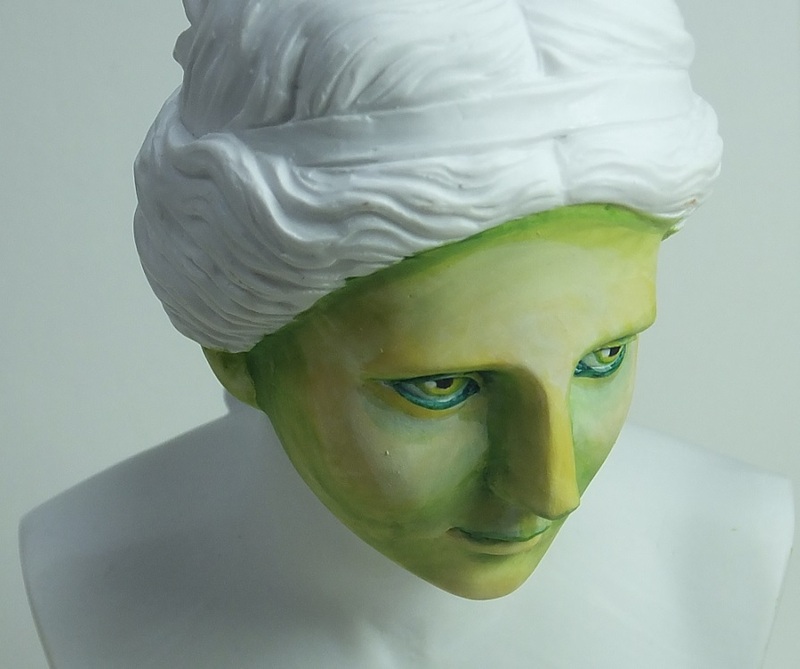 I put this one in to show the way the bust sits on the table. So the direction of gaze makes a bit more sense in context. 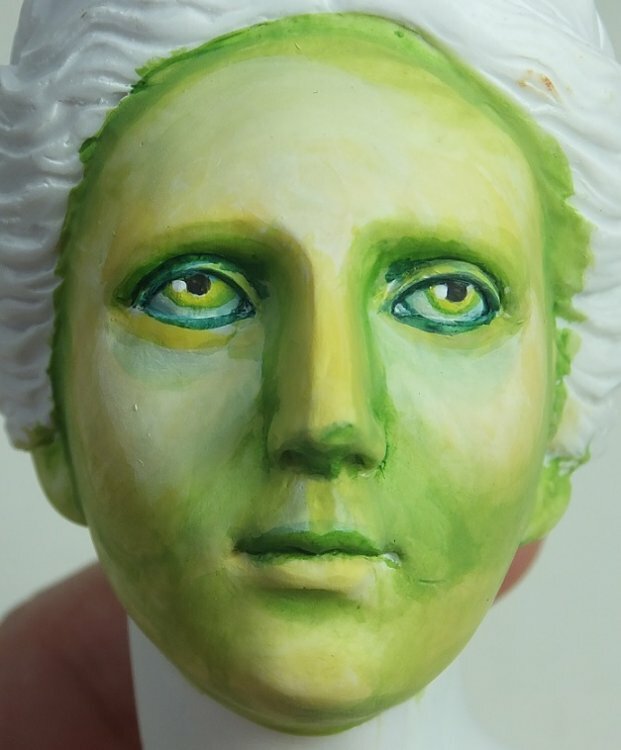 It's hard to make eyes look directly ahead and make them match up, especially with this sculpt because one eye is sculpted larger than the other. It's a lot easier to have an off center gaze. I promise to come back to the eyes, but when I first start, I bounce around and let things dry while working on other areas. So it progresses more quickly. I did some smoothing on the skin and cleaned up the eyes, chose where I wanted a few more highlights on the cheeks. Worked on the lips. See how the top lip is dark and the bottom lighter? That has to do with the anatomy of the face. the bottom one bulges out and the top slants back and doesn't catch the light. She's ginormous. So, it stands to reason I have to put more detail into her features and work harder on the blending to make it smooth. That is one of the tricks with larger minis. You have to blend the heck out of it or it won't look like skin. My trust internet model! Take a look at the eye and see where all of the highlights a shadows fall. This is based on the anatomy underneath. The eye is a big oblong ball-like shape. The lids cover this, which means they bulge out towards us. Generally, that means they catch light at their outermost part, and are shaded below. Take a look at the corner on the left of the eye. That’s the tear duct. 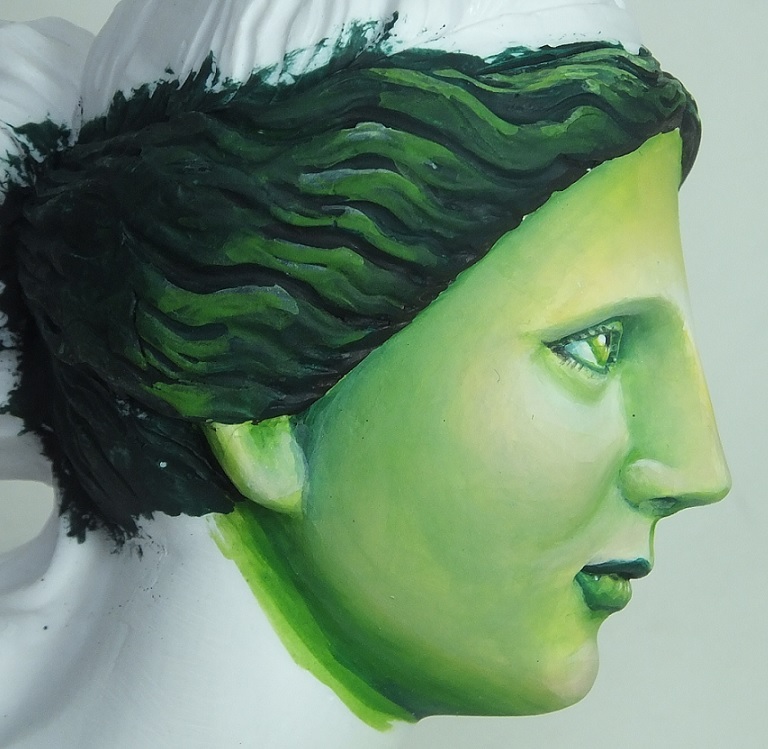 Adding that to a bust really adds a sense of realism to the painting. 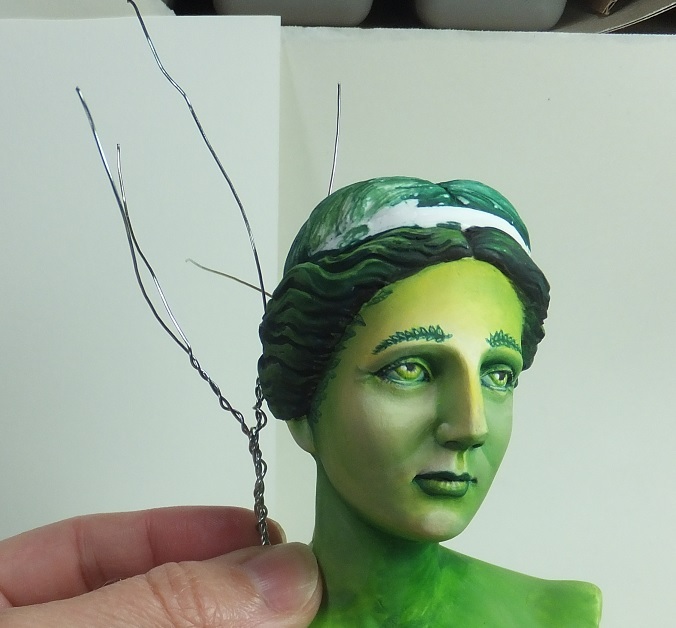 Adding the lashes and the iris lines will tuck in little details to make it more like a real eye. The sclera (white) of the eye is actually a more blueish in color, though in someone with liver issues it can look yellowish. I save pure white for the reflection so it’s the brightest spot and can still be differentiated from the scelera. Pure white in the sclera means we won’t get the full impact of the highlight and also pure white is colder. ok- must work. more soon! I'll probably edit this post and add a bunch more explanation and details, I just want to post in case the computer tries to eat it! She is gorgeous, love the colors that you selected. these two are face to face to show what I mean about picking a light direction/source. Also I've done more blending on the first pic, so you can see where the addition of a few more layers really smooths out the skin. But, I've left the left side of the face dark than the right, though there are still highlights and shadows on both. I'll probably go a bit darker on the shadowed side and maybe a bit lighter on the highlighted side. I've started in on the hair. it's still "green" just darker and I've added some walnut brown for the shadows. 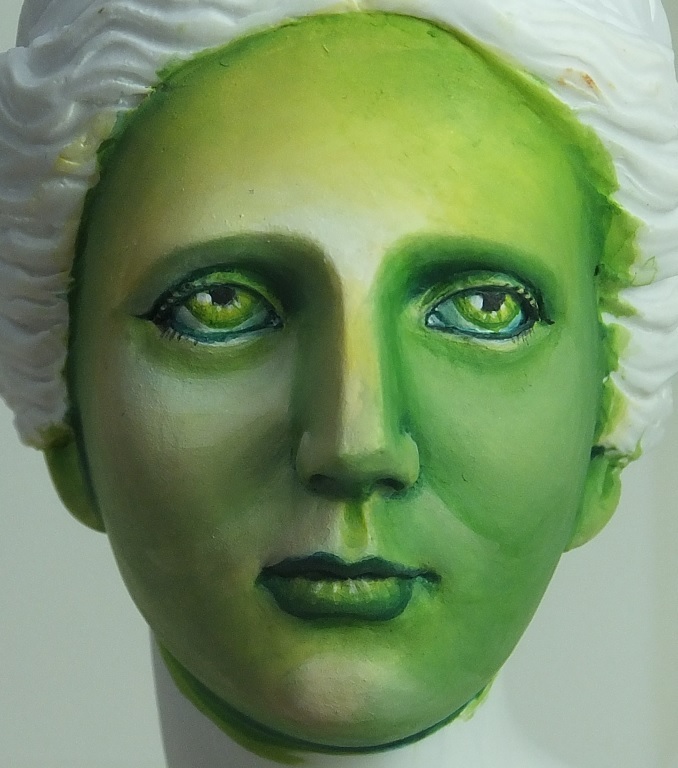 I'm also trying to soften the lids around the eyes so they're not quite so stark and hard. I'm adding some crows feet. I think of wrinkles like I think about any edge. It will have a highlight, like a sword blade, and a shadow. That transition is because the skin dips in and back out. A dip in is a shadow, the edge left catches the light. Notice how on the nasolabial fold (those folds by the side of the nose forming the apple of the cheek) there is a shadow and the a little highlight? That's because again, the anatomy dips in and out. Those folds are softer in babies and women, harder in men and the elderly. And monster- I tend to paint monsters with harder transition lines. 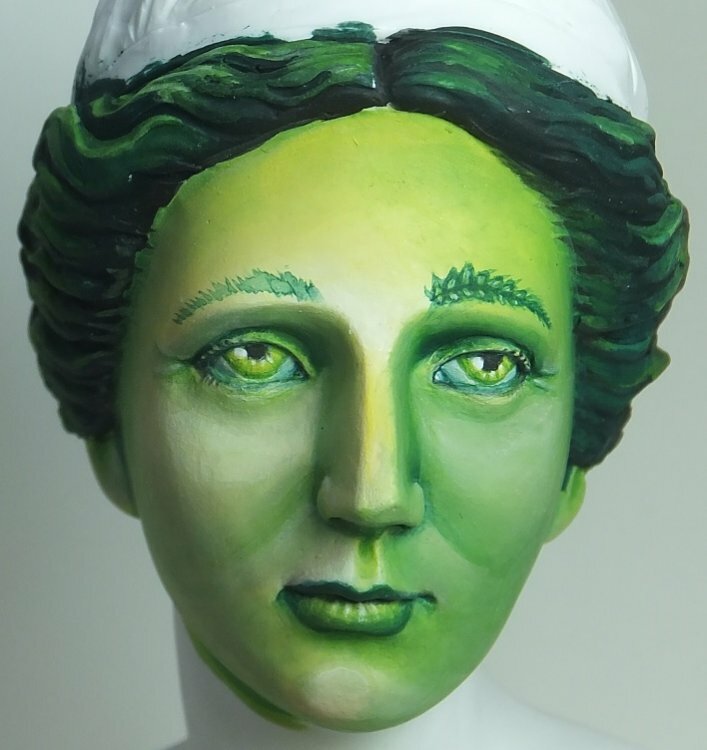 But that something to think about with busts- figuring out how soft to make a transition may make the face looker older, younger, feminine or masculine, even without things like wrinkles and age spots. 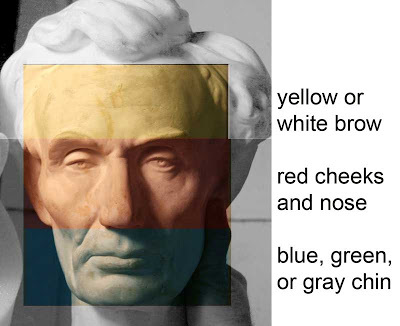 hmmn- I like having pictures to check- I need to fix the under eyelid of the right to match the left. I never pick up on this when I'm painting. sigh. This is a great tutorial. Maybe the best ever. I'm getting to the point where I want to start adding a few important features. Eyebrows! On smaller minis, I may not even have to paint in the eyebrows. 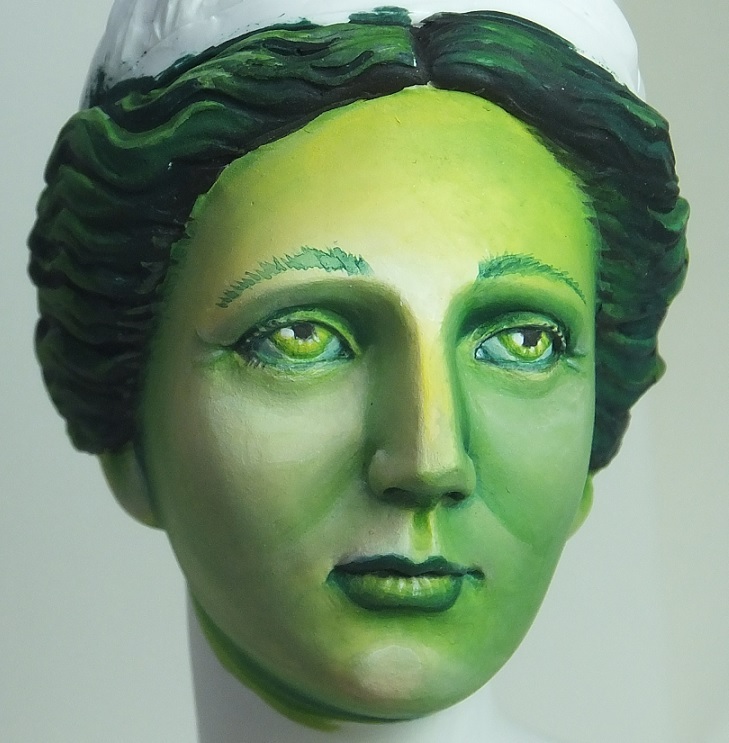 But again, busts are large, so I don't want to waste the space. I'd also added a few crows feet by her eyes, and I started in on the eyebrows. I tend to place them above the brow line. 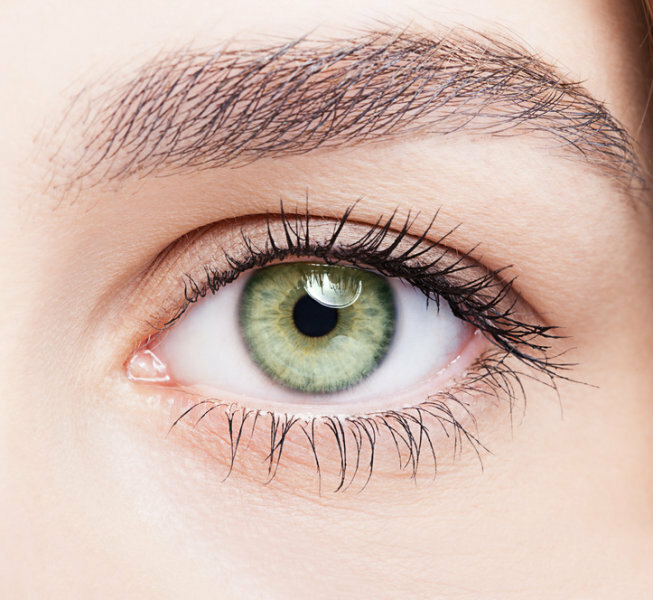 Eyebrows can come in a variety of shapes but they all tend to start and end at the corners of the eye. After sketching these in, I changed my mind. 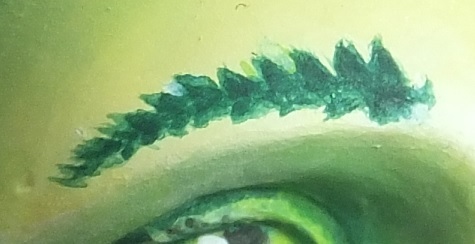 Maybe a bit over the top, but I plan to add a bunch of leaves and flowers to Mother, so might as well do a fern-like eyebrow. As you can see, I did the one side, then I'll try to match it up fairly close from the other. Here's a close-up. You can see it still isn't as neat as I can make it on our right. But I'm going to break the pattern-making down. Doing things step-wise is really the best way to simplify a pattern. So above, I've begun to make leaflets on the top. All the leaflets are dark. I touched up a bit around them in the skin section. Filled in the leaflets with white. See where I've overstepped and crossed my midline? Fixable! Still have to clean it up a bit, but I've washed the viper green/flesh mixture over it to soften the transition and also added a few veins. There we go! Leafy brows. I should probably go ahead and mention the whole zones of the face things, because I'm at the point where I need to make sure I incorporate the right shadow colors in the face. You can visit James Gurney's blog for more info- or check out "zones of the face" from his Color and Light book. It's awesome. 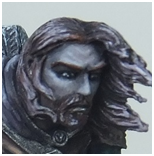 At any rate, if you look at most painted faces, you'll see how based upon our anatomy, certain parts of the face have a slightly different mix of colors. Our forehead is very thin skin over bone, which gives it a more yellowish look from the bone color showing through. There's a lot of capillary action going on in the middle section of our face, and the flesh is denser, giving us a pinker or redder look. 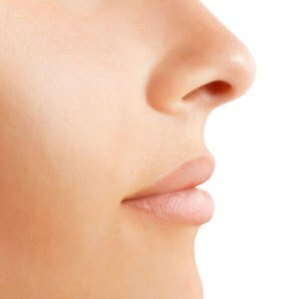 In men we can blame the gray or green chin on tiny hairs, but some of the color can be attributed to shadow as well as hair and veins. 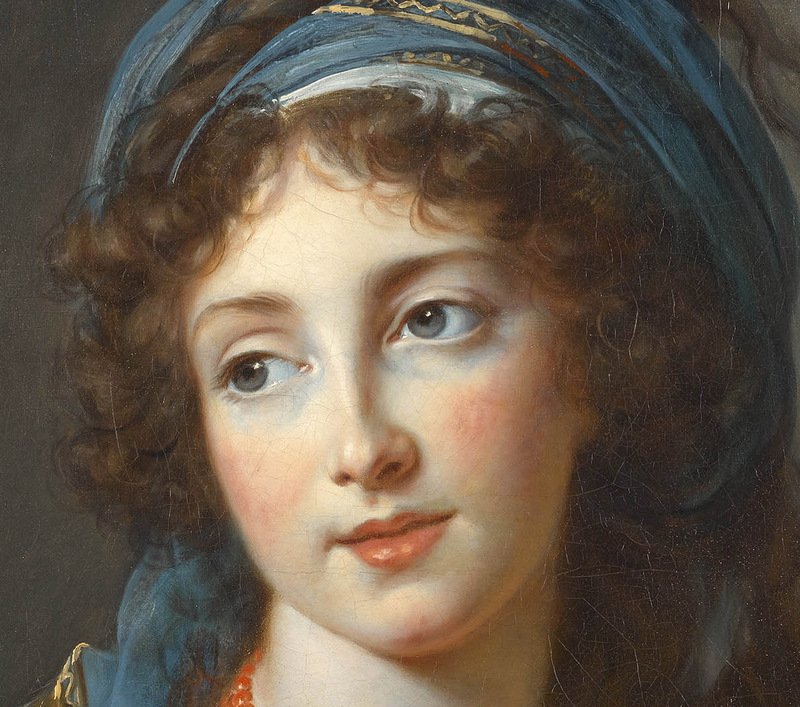 Check out this Vigee Le Brun. 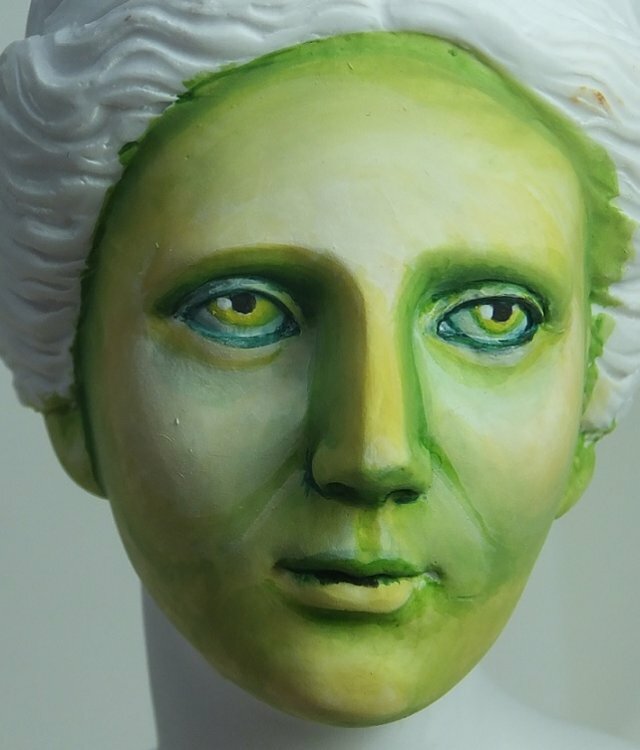 Although here she's painted some blue under the eyes as well, but around the lips you can see the blue-green shadows. It's subtle- it doesn't have to be over the top, just a touch and it makes all the difference in the world for realism. Actually, after doing face research, I need to fiddle with Mother's lower lids and change my highlights and shadows. Soon! Please let me know if you have questions or need more information. Wow. Always a pleasure to see one of your tutorials, and this is going to be a great one to watch! Thanks as ever for being so giving of your knowledge. This is such an extremely helpful thread, thank you so much for sharing all of this! 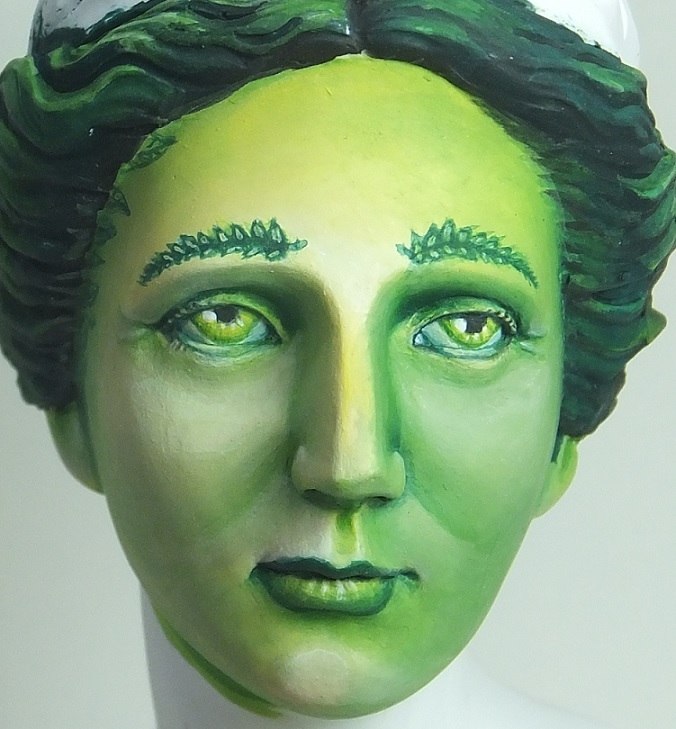 I've wanted to start working on a bust I got as practice before tackling the Morihalda bust I got at ReaperCon, but been kind if intimidated. 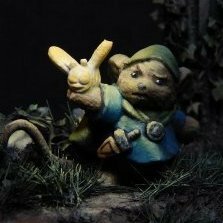 I'm more used to approximating facial features due to the scale on 28mm minis, so your excellent face painting tutorials you've done give me courage! I've got some pics of my old busts from before photobucket ate all my wips. I can try to post some of them here and show where I put things if it would help. I feel bad- I'm trying to replace all my old tutorials but the sheer number of photos is killing my desire to repeat all the work. Plus my hard drive died and took all the edited photos, so I have to go back to the original camera cards. Which since I'm a hoarder, I haven't wiped yet. yay for hoarding! One place I go to look at how people paint busts is cmon. kiril (yellowone), pepa, jarhead and nakatan are all in the top artist section and they do really stellar work on skin. I go look at their eyes and textures especially. 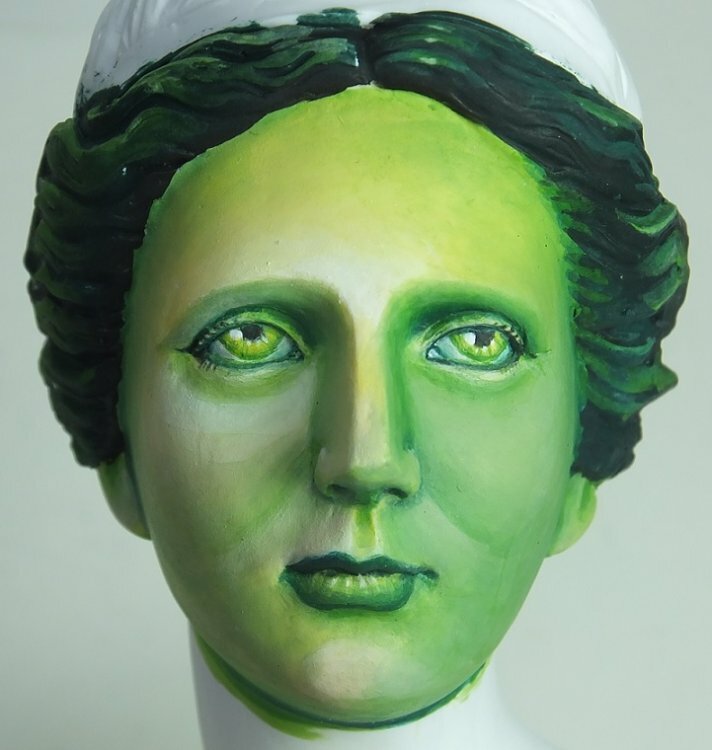 Might I suggest to take a look at Putty and Paint? Many great artists there who painted busts. The one picture of yours that I know I've seen but can't find is the one where you have a bunch of non-standard flesh tones that you demonstrated on the Bones cloud giantess. This tutorial is probably enough to compensate on it's own, though. As always, thanks for being so generous with your time. 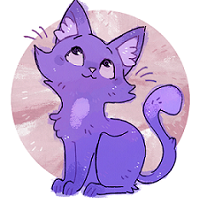 Your tutorials are amazing! Skin can be done with just about any colors, but the feel you get from the mini varies. One nice thing about colors labeled as "skin" is that they tend to be desaturated and have some fillers or opacifiers in them. The benefit of this is that these colors are less translucent, so they cover well and are designed to already read to our brains as skinlike. 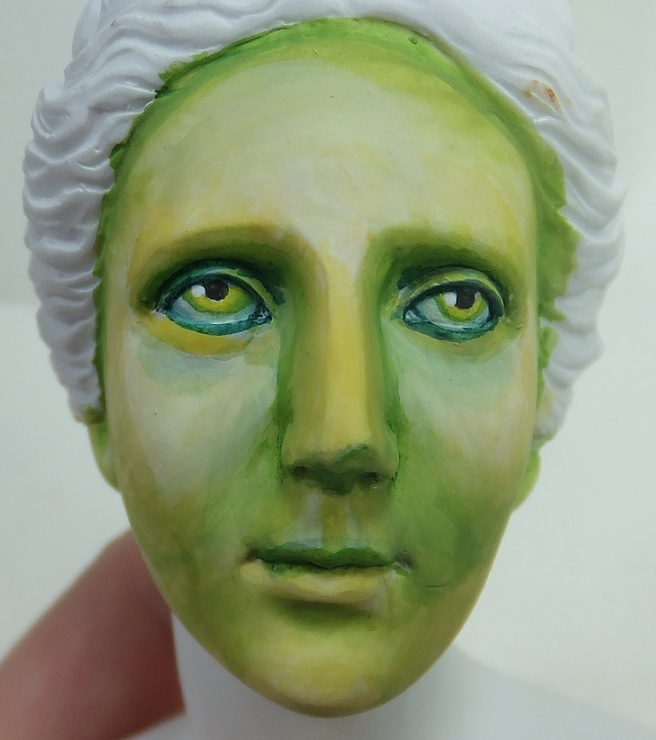 Whenever I use a weird color for skin, I'm going to see how it thins and how it plays with other colors first before potentially messing up a mini I care about. Which brings me to why bones are awesome- I can test things out on them without fear. One thing that changes the feel of skin is the choice of shadow colors. Take a look at Reubens- he always uses warm shadows, which give his paintings a soft feel- very full of life. Blood is life, right? If I'm painting a zombie, I'm not going to use pink. I usually start with some jewelry wire because I went through a jewelry-making phase and have a bunch. I happen to have a bunch of greenstuff I need to use up right now, so... greenstuff! 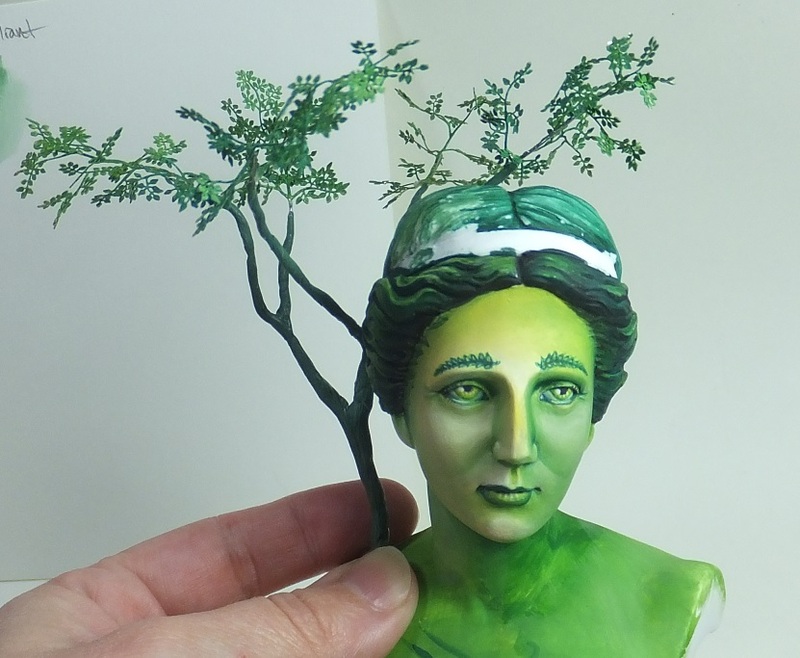 I've done trees with milliput and sculpey as well. 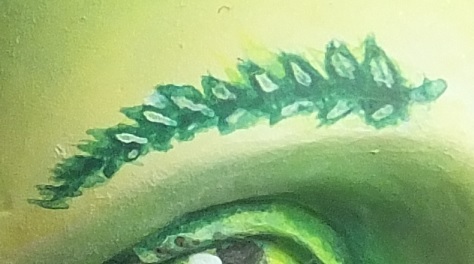 Greenstuff seems to hold better detail, milliput is a bit cheaper, and for a big tree I'll do an underlayer of milliput because it's rock hard and supports weight well. I do trees in stages. I've got my hemostat to keep my fingers off it and I'll put about that much greenstuff down, then add my bark pattern and let it dry. 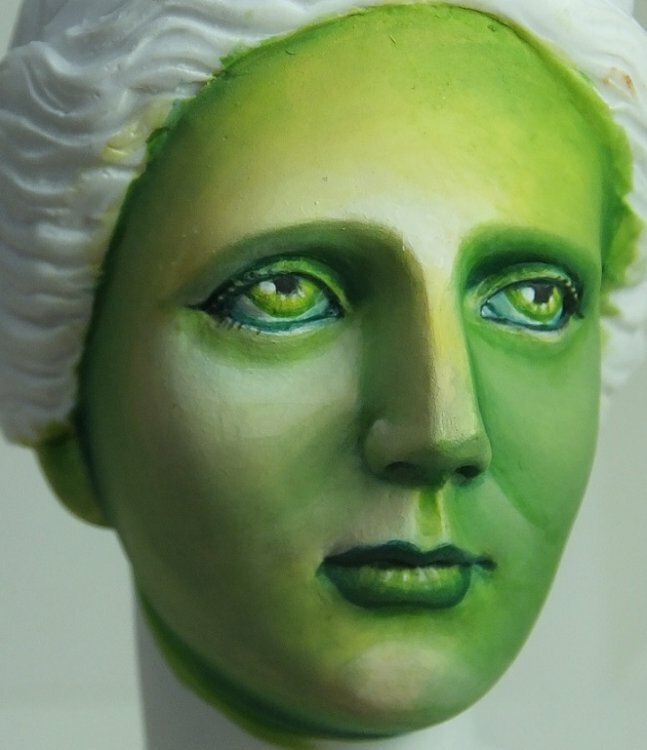 Then when I can touch the part I've already done, I'll add more greenstuff. Once the limbs are done, I like to test the fit and figure out where to place the leaves. As you can see, I'm using etched brass leaves here, but birch seed catkins are good, as are paper leaves. I actually prime and put down a basecoat before I free it from its surrounding because I think it's easier. While it looks like I might be trying for some subtle shading, actually I just used paint leftover on my palette that was getting watery from age and I wanted to use up and not waste! My first art teacher taught me frugality. Waste not! So, here's the tree. 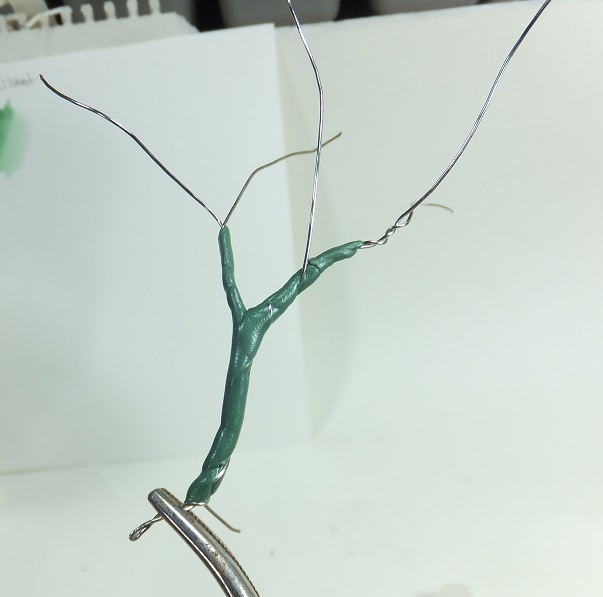 Oh- I leave some wire free at the end of the branches and attach the branch of the etched to that and trim if I need to. This is usually my most painful step because for whatever reason glue and I are not friends. I won't attach the tree until I get more painting done and at least basecoat the tree itself. I don't like having to work to get a brush in places. But, I'm planning a pattern on the chest from the treeroots into animals and plants, so I need to attach it soon! Gorgeous work as always! I know it’s super time consuming to make a detailed WIP; thank you for sharing your process with us! I’m excited to see where she goes! 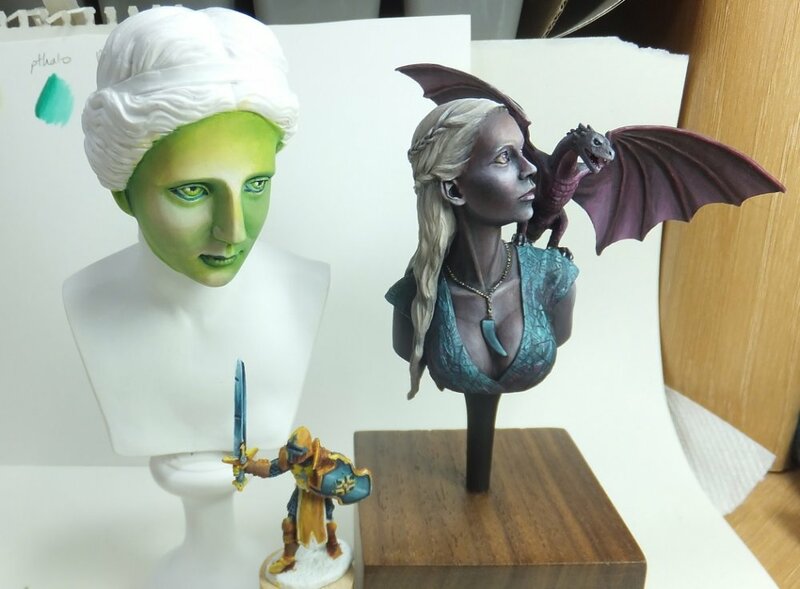 Offering 30mm, 70mm, Busts and 1/10 () Scale figures. Something for everyone! I got the early bird 4 bust deal. FWIW I have some of their earlier figures and they've been very good quality.